The family of new water blocks for ASUS/Intel-powered extreme workstations includes the full-metal EK-Velocity WS for the narrow ILM Socket P (used for Intel’s LGA3647 processors) as well as the EK-VRM ASUS ROG Dominus Extreme for the 32-phase VRMs of the ASUS ROG Dominus Extreme motherboard. Since VRMs used on mainboards designed for overclocking tend to dissipate heat in the form of switching power losses, it is crucially important to cool them down to ensure stable operation of overclocked CPUs under high loads. Both water blocks feature a precisely machined copper base made of extremely pure copper and treated with nickel plating in order to prevent its oxidizing over time. The top of the devices is made of very sturdy nickel-plated brass. 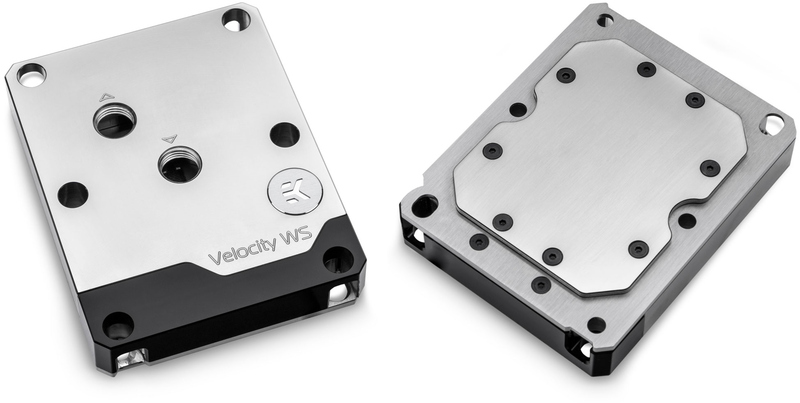 EKWB says that the strong VRM water block will make the motherboard more rigid and avoid its deformation over time. Both water blocks feature two standard G1/4-inch threaded ports. As an added Insentif, EKWB’s new water blocks for ASUS’s ROG Dominus Extreme feature RGB-lit EKWB logotypes. EK Water Blocks has already started to sell its new products directly and soon will make them available through its resellers. The EK-Velocity WS is priced at €249.0, whereas the EK-VRM ASUS ROG Dominus Extreme costs €219.0. EKWB was one of the first to offer its Xeon W-3175X-aimed EK-Annihilator Pro water block for custom LCS several weeks ago. With its EK-Velocity WS for the CPU and the EK-VRM ASUS ROG Dominus Extreme for the motherboard the company is expanding its offerings for Intel’s extreme workstation platform.